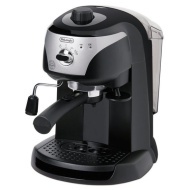 alaTest has collected and analyzed 147 reviews of DeLonghi Motivo EEC220. The average rating for this product is 4.2/5, compared to an average rating of 4.4/5 for other products in the same category for all reviews. Reviews about the design and price are on the whole positive. The performance and usability also get good feedback. Opinions about the noise and maintenance are different. There are some less positive views about the reliability and durability. We analyzed user and expert ratings, product age and more factors. Compared to other products in the same category the DeLonghi Motivo EEC220 is awarded an overall alaScore™ of 86/100 = Very good quality. Had it a month and so far no leaks. No vibration, so cups stay put. Makes great coffee and the milk steamer heats the milk well, with lots of froth when needed. Drips badly Standard - size mug does not fit under. Get round this by replacing driptray with shallow plastic tray from eg small pack of cherry tomatoes ! You can actually fit a decent sized cup under the filter. If you're not going to spend hundreds and hundreds on an espresso machine get this one. It's just as good as a £150-200 machines for making shots. Absolutely love it. It's as quick as the kettle - but tastier coffee. Has paid for itself in lattes as I no longer need to visit coffee shops for a decent coffee. It's popular with friends too. Makes excellent coffee. Looks good and isn't too big.